» A commitment to WHAT? Reading material comes along with the food. 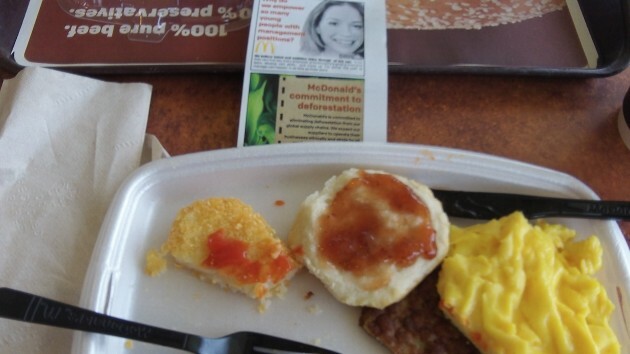 While I was having breakfast at McDonald’s, I glanced at the back of the sales slip, which assured me of the company’s “commitment to deforestation.” Whoa! This did not sound like the kind of message you expect. I’m not sure breakfast eaters at McDonald care all that much about forests. Forests may not be at the top of their list of things to worry about. Still, that’s quite an admission, being committed to deforestation. Almost as serious as being committed to pollution or, worse, changing the climate. Ah, “eliminating”! I guess that was too long a word for the headline, so the copywriter in charge of sales-slip promotion decided to leave it out. It worked, too. Made me read the message. From your picture, potentially only three things? I think the observation that one shaves a few days off their life —is stupid. I’m not sure how many days McDonald’s fare would shave off your life, but I do know that not eating anything will shave a whole bunch of days off your life. TINSTAFL!